The Los Angeles Kings have signed 24-year-old forward Kyle Clifford to a five-year contract extension. 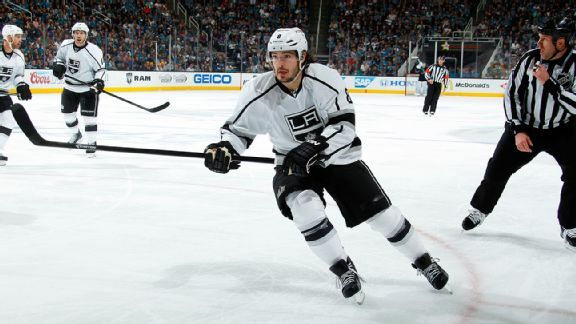 Los Angeles Kings defenseman Drew Doughty missed the first practice of training camp Friday with an upper-body injury. NEW YORK -- Are the Los Angeles Kings where they are -- on the precipice of capturing their second Stanley Cup title in the past three seasons -- solely because of a single player? The Kings are finally the favorites in a series, and luckily, got comfortable just in time. LOS ANGELES -- The Los Angeles Kings sure have a flair for the dramatic, huh? 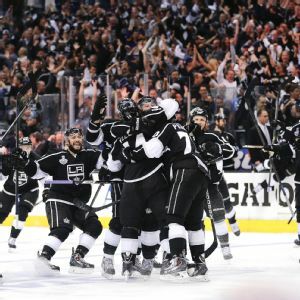 For the second straight game L.A. wiped out a two-goal deficit, rallying to take Game 1 of the Stanley Cup finals with a 3-2 overtime victory over the New York Rangers Wednesday night at Staples Center. With mere hours left before the pre-Olympic roster freeze goes into effect (3 pm ET Friday), all appears relatively quiet on the NHL trade front. Unless the Edmonton Oilers and Los Angeles Kings pull the trigger on a deal rumored to include forward Sam Gagner and forward Kyle Clifford, this seasons first unofficial trade deadline could pass without making much of a ripple. Left wing Kyle Clifford has re-signed with the Los Angeles Kings, agreeing to a two-year deal worth $2.15 million. Now that they've inked Trevor Lewis for another year, the Los Angeles Kings are probably just about done with their summer to-do list -- at least in terms of signing players. UPDATE: So far, the Los Angeles Kings haven't had any luck in trading Kyle Clifford. Under the circumstances, the club may want to adjust their asking 'price' for the young forward.